The site is largely devoted to family history, ancestry and historical documents associated with our family trees. This is an entirely non-commercial site run for personal interest. To commemorate the centenary of the Armistice we are reproducing an extract from the pocket diary of Nurse Molly Evans. At the time she was working in a hospital just outside Dunkirk, where she had been for the previous fourteen months. 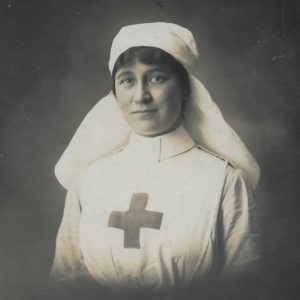 The diary entries are complemented as illustration by copies of a few exhibits from her First World War Nursing Scrapbook. The hospital was close to the front lines and had been under frequent attack from shell fire, air raids and the threat of gas attack. The extracts show a still busy hospital, struggling to save lives, and how this fitted with the impromptu celebrations of a long awaited peace. There is also a ‘search’ box below, if you wish to search the articles and their contents.